The horrific shooting in Christchurch, New Zealand is on my mind this week. As are Charlottesville, Pittsburgh, Charleston. I plugged myself into the news as I walked home from the YMCA and listened to an interview—I don’t even know who was being interviewed—but it was disturbing. Queasily disturbing. The man on the radio was talking about the way that the internet has nurtured the white nationalist movement, how there are algorithms that guide internet posts so they can slowly draw people deeper into the bizarre conspiracy theories and hate-filled rants. Facebook tried to stop the video that the white nationalist shooter broadcast as he murdered fifty people, but they couldn’t. People who want to watch the grisly scene can still find his video. I can’t make myself look at stories about the victims today. Despite knowing we have a responsibility to not look away, I desperately don’t want to feel the pain in this intimate way. I wonder what I, as a poet and children’s writer, can possibly offer that could help to change the trajectory the human race seems to be on. Human beings don’t begin their lives with hate. On the contrary, research shows that our children come wired for “prosocial behavior.” My son’s baby sister arrived when he was two years old. I remember how tender he was with her, how he would gently kiss her cheek and try to comfort her when she cried. 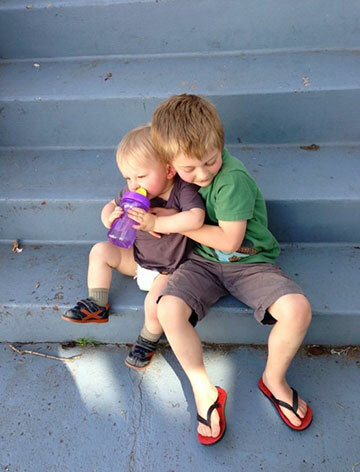 Children are often much quicker to share, to comfort and to help than we give them credit for. Babies as young as two- or three-days old show signs of distress when other babies cry. By two years of age, children are good at offering comfort. It’s critical, of course, that parents reinforce this behavior, and children’s writers have the lucky job of helping them with this. We can make books that parents can read to their children as they hold them in their laps, to let them feel loved and secure, secure enough so they don’t have to rely on hating others to feel good about themselves. We can also write stories that reinforce children’s instincts to care about each other, to be kind and loving. We can put one foot in front of the other, write one page after another, and do our best to contribute to a happier trajectory for the human race.